The West Lancashire branch of the Masonic Trout and Salmon Fishing Charity held their first event of 2018 on a pleasant spring day at Whitmore Fishery, Greenhalgh, Kirkham. 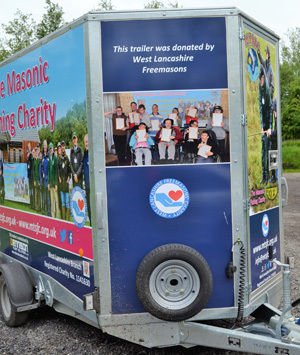 Pictured is the trailer, which has been donated by the WLFC to the West Lancashire branch of the Masonic Fishing Charity. Whitmore caters for all anglers and has 12 waters from which to fish. On this occasion the young adults, their carers and volunteer casters fished from the ‘Lodge Pool’, which is close to the café and ideally suited for creating a safe environment in which the special needs youngsters could enjoy their fishing experience. Having arrived at 10:00am, the youngsters were introduced to their castors for the day and after a busy morning fishing, in which some nice specimens of carp and ghost carp were caught, lunch was served at around midday to all the contributors, including the young adults, their carers, castors and volunteer helpers, with everybody getting back to the water at 1:00pm. Fishing finished at 2.00pm and certificates of achievement, acknowledging their participation at this fishing spectacular, were presented to each enthusiastic young participant by the Deputy Provincial Grand Master Philip Gunning and Past Assistant Provincial Grand Master Harry Cox. Also in attendance at the event were the Provincial Grand Director of Ceremonies Keith Kemp, Chairman of the West Lancashire branch of the MTSFC, Provincial Grand Secretary Peter Taylor and Martin Lockyer, Chairman of the Community Grants Executive at WLFC. It’s great to see the sheer enjoyment expressed by the youngsters whilst taking part in the fishing, which for many was their first experience of it. Martin was pleased to be in attendance at this particular event, as it was the first time the trailer, which had been funded via a grant from the WLFC, had been used. The trailer has been professionally ‘wrapped’ and will be used to carry all the apparatus that is required to host a fishing event. The charity is going from strength to strength and with continuing help from Freemasons within West Lancashire, the situation looks good for the future. We have three further events planned for 2018 and if anyone would like to get involved with the charity please contact one of the names below. A group photograph to remind all of the fantastic day it had been at Whitmore Fisheries.